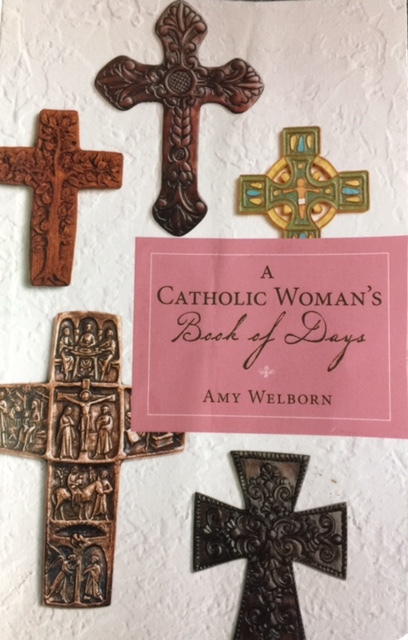 Yesterday, the daily devotional from “A Catholic Woman’s Book of Days” really touched my heart. The author recounted a time when she took a group of high-school students to a retreat day at a Monastery. Part of the day involved attendance at Mass. Afterward, some students remarked that the experience had been different from Mass at their home parishes. “Here, it was like the focus was all on God. At home, it’s more like it’s all about us. Wow. Such insight from young minds. For many years, I was the one who was sometimes bored, thinking that Mass was supposed to entertain me, or that it was meant as only a fellowship time with my Church friends. If the music was “good,” and the homily was “catchy and interesting,” I considered myself “fed.” Otherwise, I really just went through the motions, fulfilling my Sunday Mass obligation. Then I read “The Lamb’s Supper” by Scott Hahn. How misguided and totally selfish I was. You see, the Mass is not intended to be of entertainment for us. We can be entertained anywhere in this world. The Mass is a gift offered to us…to share in the Eucharistic Table together, in humble worship of Our Lord and Savior. How blessed we are, that we have been invited to share in this banquet feast…The Lamb’s Supper. During Mass, we are led to turn our minds and hearts to Our Lord, Jesus. We worship through hearing His Word, singing praises to Him, and receiving the Body and Blood of Jesus. Through the Eucharist, Jesus becomes one with us. He is in us, and we are in Him. What could be more spirit filling than actually receiving Jesus into our bodies…into our beings? When at Mass, we are in communion with The Father, Son, and Holy Spirit. We are also accompanied by God’s angels and saints. The Communion of Saints…how mystical and beautiful! How blessed we are to have a tangible way to be intimate with our Lord. To be totally one with Him, and through Him. Lord, I thank you for gifting us with your Church on Earth. Thank you for inviting us to this Loving Banquet. Please send your Holy Spirit to infuse our hearts, minds and will with your amazing and unfathomable love, joy, and mercy. Categories: Catholicism, Christianity | Tags: catholic, Catholic Mass, Communion, Devotional, Eucharist, fellowship, Holy Spirit, jesus | Permalink. Yesterday was Election Day. So many thoughts are going through my mind today. How could there be so many with their eyes closed to what is happening right before them? This country, and the world, would be a different place if we really lived our Faith. How can a Christian support the killing of innocent babies in the womb? How can a Christian support homosexual “marriage”? How can a Christian trust, support and give the right to the government regarding our healthcare? Why would we give up our God given freedom and hand it over to the government? How can a Christian support the government’s right to be in charge of dispensing our hard earned money? Why would we trust the government to use our money in any way they deem fit? Wouldn’t a Christian want to support causes that the Lord leads them to…and choose the way he is led in charity? Why do we support a government that is chipping away at religious freedom? Why would anyone accept that “Heather has Two Mommies” is ok, however, “The Bible” is not? Why is it ok for the government to force companies or Churches to comply with the government’s truth concerning areas of religious faith? Why do we blame guns for the wickedness that is running rampant in the hearts of men, however, we are unable to teach the Saving Power of God, or even mention His name in our schools…when HE is the only answer to the blackness that is overtaking souls? Please, let’s take a step back and look at what is happening all around us. The questions I just asked are just a small portion of what has been sneaking into our country while we are sleeping. Or are we just pretending to be asleep so we don’t have to take a stand? What I see is a government that is phasing God out, and stepping in to take God’s place. Is that what you want? Is that what we desire for future generations? Something to think about, isn’t it? Lord, please forgive us for our laziness, complacency, and sinful pride. We ask that you send your Holy Spirit to search our hearts for the sins in our lives that need to be acknowledged, and ask for the humility needed to allow us to beg your forgiveness. We throw ourselves at your feet, and rest in your healing mercy and grace. Jesus, have mercy on us. Jesus, save us. Jesus, lead us to fulfill your purpose. Categories: Catholicism, Christianity, Prayer | Tags: abortion, Bible, catholic, god, Gospel of Luke, jesus, Money, pro-life, women's choice | Permalink. My husband and I are enjoying a wonderful visit with our niece, her husband, and their two sons. We’ve never visited with just our two families…usually our visits are confined to extended family events, which are always filled with fun, food, confusion, and lots of noise. Did I mention LOTS OF NOISE??? Haha!!! Although we love our time with the whole family, it can get overwhelming! Something my great nephew did when they first arrived at our home kind of jolted me. In a good way…it was refreshing. The same scenario happened with one of the sons of our previous houseguests, who are very good friends of ours, who had never been to our home before. As soon as the boys came in the house, I noticed them looking around, especially up the stairs. After a few moments of that, one of my (great) nephews said, “Can you show us your house…can we have a tour?” I could FEEL their curiosity, and it warmed my heart to hear the question asked with such innocence and simplicity. So many times, I would have loved to “tour” a friend’s home, but would never even think to ask. So we started the room to room tour. In each room, they both looked around, very interested, and even asked questions. Then they asked the un-askable…”What’s in there?” The closed doors of our closets were very interesting to them. I swung them open and showed them all the hidden things inside. Questions were asked, curiosities were addressed, and we moved on. This little interaction started me thinking. “And he said: “Truly I tell you, unless you change and become like little children, you will never enter the kingdom of heaven.” What was Jesus trying to tell us in this passage? A few thoughts come to my mind that might be attributed to children…teachable, humble, innocent, inquisitive. Are we always open and willing to ask questions about those things that are a mystery and “hidden” to us? Are we seeking answers with a humble spirit, and looking for the answers in the right places? I had many questions about my Catholic faith for many years, and those questions just tumbled around in my head and heart, causing doubt and misdirection in my soul. I even read books that were against the Catholic Church, and all it stands for. I was nothing but confused. When I finally starting looking for answers through scriptures, meeting with my priest, and reading about the Catholic faith, my questions were finally answered in my heart and soul. Like my young nephews, I was able to assess what was revealed to me, ask questions, and then move on. Another thought popped in my head. What “hidden things” are closed up in our “closets”? It is those things…the hidden things of the heart…that form the fruit of our lives, whether it be good or bad fruit. Our fellow Christians and unbelievers alike, are interested in learning what is contained in our “closets”. They are curious, and are not just interested in words or a Christian façade. They are searching for the Truth. They will know it when they see it in you. The question is…are you ready to let go, to swing the door of your heart open to reveal all the hidden things? Categories: Christianity, Family | Tags: catholic, children, Christian, Christianity, closet, Truth, unbelievers | Permalink. There is a world full of need out there. All you have to do is read a few headlines or listen to some news, and you can quickly feel overwhelmed with the suffering, misery, and evil in the world. How many times do you think, “that is just so horrible”, or “how could someone even think to do something like that?” Sometimes you feel such compassion or empathy for the people involved, that you want to do SOMETHING. Then you turn off the TV or click off your computer, and you kind of forget about it. Does that sound familiar? I think we are overwhelmed because of the sheer number of things we hear about every day. Sensory overload. It’s hard to focus because of the bigness of the need…after all, what could one person do that could even make a dent? I think the first thing we can do is realize that we are watching a biased view of reality. We are mostly seeing only the negative, because that’s what makes for “interesting” news. Right at this moment, there are countless acts of love being showered on people in need. You might hear of some of these acts of kindness, but I can guarantee that the numbers are much higher than you think. Because of this sharing of love, many sad and hardened hearts will be opened to the pure healing power of Jesus. There are so many ways the Lord moves to touch the hearts of those who are lost. Remember, He is the Good Shepherd – He will always find a way to pull in His lost sheep. Are you ready to be used by your loving God? Have you made the choice to open your heart and soul to Jesus, allowing Him to work through you? Do you feel a tugging at your heart…a feeling that you are being called in some way but you just can’t figure what it is? God is calling you to share His love. God created you because you play an intricate part in His plan. You can touch certain people in a way no one else can – you possess gifts and talents that are unique to you. You were given exactly all that is needed for your place in the Body of Christ. Don’t let the world’s problems overwhelm you into doing nothing. Ask the Lord to direct you…to open your eyes so you can see the needs of those that are around you, and ears to listen to how you can help them. You will know where the Lord is leading you; you will feel it in your soul. It may be He is leading you to do something HUGE or it may be small acts of love and kindness. The key is to take the first step, which leads to the next, and the next. Once your eyes are open, you will be surprised how aware you become of the people right in your midst…who have been there all along, who are waiting for you to take that step, in love, toward them. Categories: Christianity | Tags: Body of Christ, catholic, charity, Faith, god, Good Shepherd, jesus, love, Relationship | Permalink. Remember the old adage, “People need loving the most when they deserve it the least”? When I hear or read those words, I understand the basic truth, but come on….isn’t this one of the most difficult things to put into action? I mean, if a person’s general demeanor is negative, and does not care one bit if he offends or hurts me or anyone else, am I really expected to treat him lovingly? The short, Christian answer is YES! In my personal life, there have been family members, friends, co-workers who seem to relish the idea of making me personally feel uncomfortable, or maybe have an abrasive, negative personality toward everyone in general. You know the kind of person – it’s the one who makes you cringe when she is walking toward you, the one who relentlessly gossips about most everybody, or who constantly shoots stinging remarks, instinctively knowing how to push the proverbial button on everyone she comes in contact with. It’s a human defense strategy to back away from people like this, and if you are at all like me, you put up a defensive wall to protect yourself from the pain or embarrassment this person may cause you. I usually find a way to avoid these people. So…people need loving the most when they deserve it the least…what does that mean to me? I have learned that when people truly love, respect, and accept themselves – love, respect and acceptance will shine from them toward the people they interact with. Since they are aware of their own personal value, they tend to value each person in their lives. They will still make mistakes and hurt people occasionally, however, when they are made aware of hurting someone, they are sorrowful and ask forgiveness. Make today the day to send love to that one person who just rubs you the wrong way; or that person who is so negative, you can hardly force yourself to spend time with him/her. Love can be sent in many ways; I will share some that have worked for me. The first and most important way to love is to PRAY for that person. Yes, pray that the Holy Spirit fill his heart with total love, that he will feel the love of Jesus. Ask the Lord to send His Holy Angels to guide him toward Jesus, and to protect him from satan. Also pray for healing for that person, whether it be physical, emotional, or spiritual. As you pray for him, you will eventually feel a softening of your own heart toward him. The second way to love is to ask questions. Ask him about himself, get to know him. Really LISTEN to what he says. You may get a clue as to what he has experienced in life to bring him to the place he is now. I have learned that the people I have the hardest time with have usually suffered and endured painful, horrendous things in their past. Once I know a little of their story, I find more compassion in my heart for them. Other ideas may be sending cards (even anonymously), little thoughtful or funny gifts, or simply flashing a genuine smile. So, let’s make this the day to take a step forward in unselfish love. Please share your ideas of ways to help a person know “Somebody Loves Me”. God will magnify your efforts! Matthew 5:43-48 You have heard that it was said, ‘Love your neighbor and hate your enemy.’ But I tell you, love your enemies and pray for those who persecute you, that you may be children of your Father in heaven. He causes his sun to rise on the evil and the good, and sends rain on the righteous and the unrighteous. If you love those who love you, what reward will you get? Are not even the tax collectors doing that? And if you greet only your own people, what are you doing more than others? Do not even pagans do that? Be perfect, therefore, as your heavenly Father is perfect. Categories: Christianity | Tags: catholic, charity, Christian, god, God the Father, Holy Spirit, jesus, love, relationships, Somebody Loves Me | Permalink. Thought I would share a prayer with you! Open my eyes to your will and help me to see your Truth. Please send your holy angels and saints to protect and guide me through the snares of the devil. I offer to you all that I am. Please take my strengths, weaknesses and sins and transform my mind, body, spirit and soul to your image – for your glory. Strengthen my faith and allow your love to shine through me, to touch a world in need. Amen. Categories: Prayer | Tags: catholic, Christianity, god, God the Father, HolySpirit, Lord, Prayer, Religion and Spirituality, Rosary | Permalink.